The effect of earth's spin as a perturbation to static earth potential, the farther we are the larger gets the deviation even from a tiny earth spin of w = 7.28 x 10^-5 radians / second. Newton was the first Physicist to suggest a way to measure the earth's spin, the later experiments (centuries later) that followed these were successful. 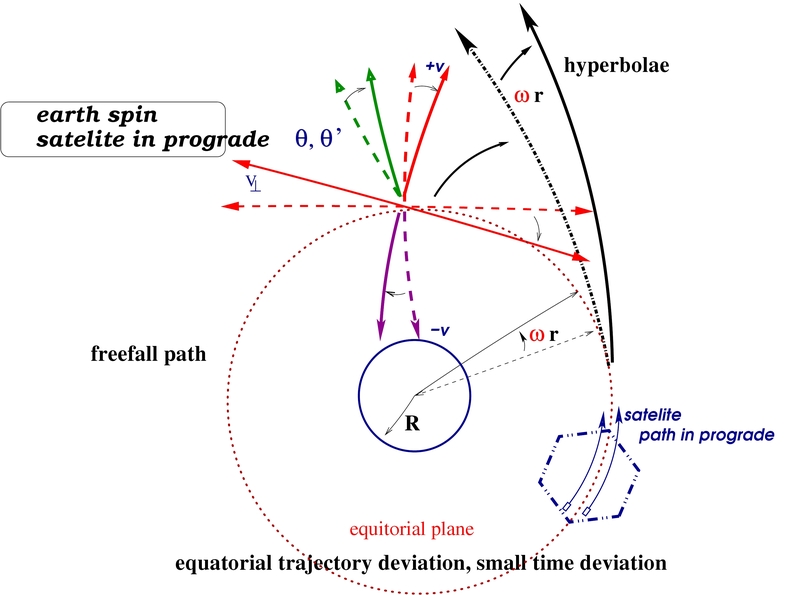 This diagram here is a projection of the satelite trajectories in the equitorial plane of earth and a prograde (along the spin) motion. Retrograde motion causes opposite effect. Actual satelite motion is along trajectories that are described by an angle of inclination. This perturbation causes additional special and general relativistic time dilations or frequency shifts. 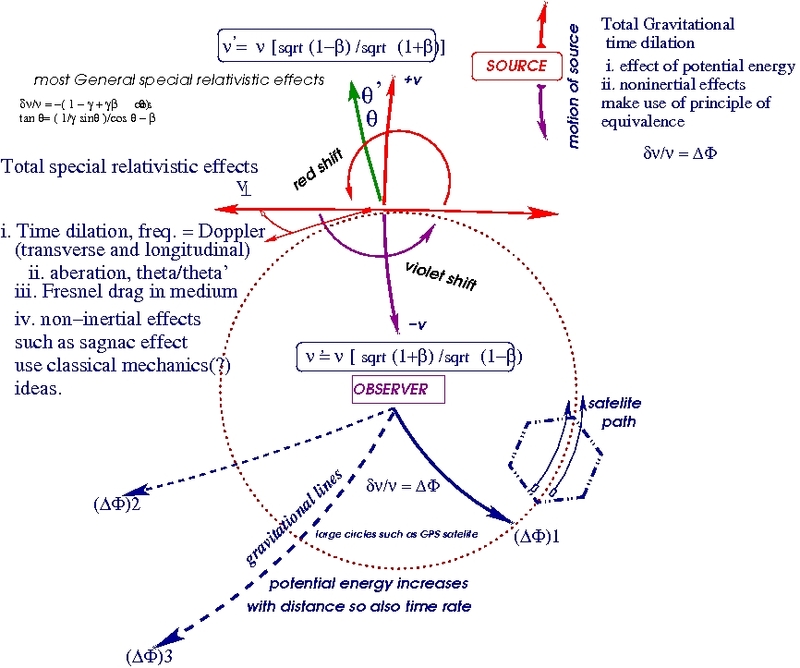 (WILL MAKE THIS DIAGRAM A LITTLE BETTER) The summary of relativistic effects on time/frequency due to Special relativity and general relativity. a proof of why transverse Doppler is always redshifted and hemisphere approach and hemisphere of recession are always oppositely shifted using the binomial theorem and properties of logarithm will be uploaded later. Also for gravitational effects there is usually a tradeoff between red and blue shifts which I have nomenclatured a "tradeoff impact parameter". NOTE: the hemisphere of approach is completely blueshifted determined from the angle of approach for a static sphere, I have considered the complete angle analysis in which I considered upto 3rd order in velocity. **For spinning spheres again you have to introduce another cosine(or sine?) term everywhere there were vectors and cosine terms in the original equation. eg spinning earth perturbations. They change V_perp, v, cos(theta) by the amount of perturbation through the cosine of perturbation angle. iii. run slower in the Doppler plane of intersection of hemisphere of approach and recession. The GPS satelites eg are in constant free fall towards earth and located in the Doppler plane of intersection, they never approach us as they never recede away, hence they induce a constant time dilation or a frequency “redshift” **. That is the more time is spent the more the dilation adds. ** redshift is defined in terms of wavelength and frequency. wavelength increases and frequency drops in a given time. That means the time is increased or dropped from it’s proper value, if the proper value is computed in a reference compared to which the motion is studied. I had mentioned a week ago, from binomial analysis I have proved now that all inertial special relativistic effects (Doppler shift) are time dilation = red shift for transverse motion and time dilation = red shift for longitudinal recession and time contraction = violet/blue shift for longitudinal approach. In the transverse case which is exactly a time-dilation formula as taught (moving clocks run slower) is only a special case of time dilation/contraction. Moving clocks run faster if they are approaching us along our line of sight a thing not said enough times to our students. In other words for an observer inside a sphere of reference the general motion of a clock is one hemishphere (hemisphere of approach) Lorentz contracted and one hemi-sphere Lorentz dilated. (hemisphere of recession) The total sphere you can call a Doppler sphere. This I have verified to 3rd order in “beta”. The satelites in free fall towards earth are neither in approach nor in recession hence they represent the transverse Doppler and always in red-shift or time dilation. This is a property of the binomial numbers. I have the related diagrams and the calculations. I will update the calculations first and after some more additions the diagram. The scanner is uptight so you will have to wait till there is a way out, for the calculations. For diagram, it is my whim, don’t complaint ..